As I headed back to Houston after my trip to the Southeast, I decided to take the northern route because I wanted to see... BUTTONS! 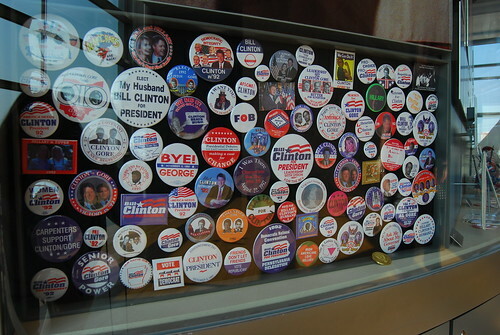 These are buttons collected by Bill Clinton, forty-second president of the United States, during his presidential campaigns. 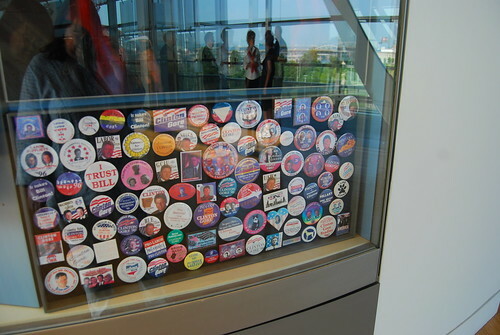 They're on display at the William J. Clinton Presidential Center, which was my destination and the reason I spent a night in Little Rock, Arkansas. 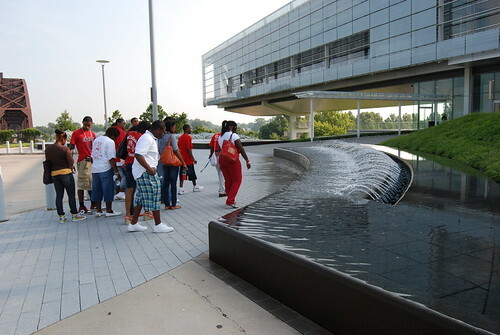 The Center is on the banks of the Arkansas River. 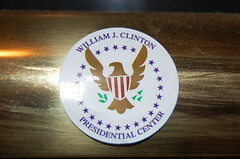 President Clinton wanted this location for several reasons. The river played an important part in his childhood, in the growth of the state of Arkansas, and to the expanding United States. The river has a number of bridges crossing it visible from downtown, and Clinton wanted the structure of the Center to look like a bridge. You may recall how often he talked about his administration building a bridge to the twenty-first century. 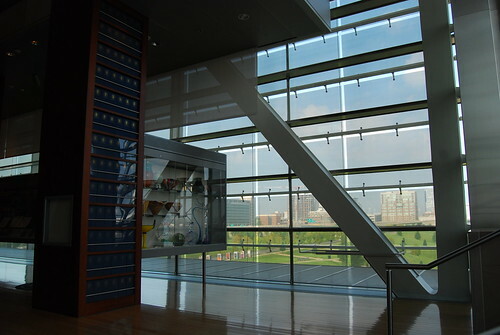 When you're inside the Center, you can see many views of the river, and the building's architecture mimics that of a bridge. 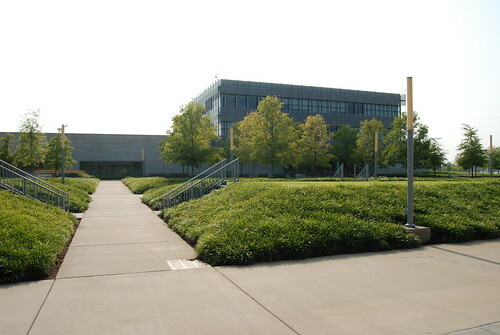 The building is several levels, and the top three public floors are open and airy. And it's very GREEN! I've been reading about how the Center was designed so that its existence and use would have little negative impact on the environment. You can't tell me my president didn't learn something from Al Gore. 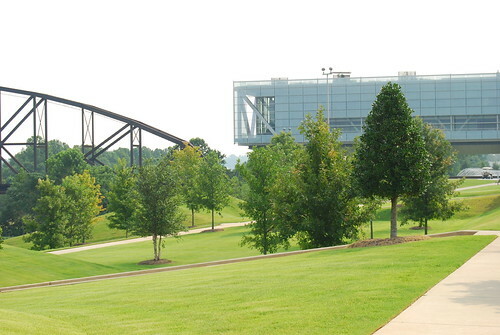 Part of the agreement between President Clinton and the city of Little Rock in placing the Center there was based on his promise to develop and maintain public park space. The thirty acres of grounds around the Center are gorgeous, with over 700 new trees planted including maples, oaks, magnolias, cottonwoods, gum, birches, holly, ash, pine, willows, sycamores, and others. There's a promenade at the river's edge--which, by the way, is being designed as a restored wetlands habitat--benches and picnic tables, and lots of green grass that's meant to be sat on, lain on, and enjoyed. There are no signs keeping visitors off the grass here; the property is intended to be used and enjoyed. I once wrote a poem around the image of a little boy in Arkansas lying on the grass and staring at the clouds. Who knows what great ideas may form in the mind of a child who does the same on the lush grass of this spot of natural beauty in the middle of the city? 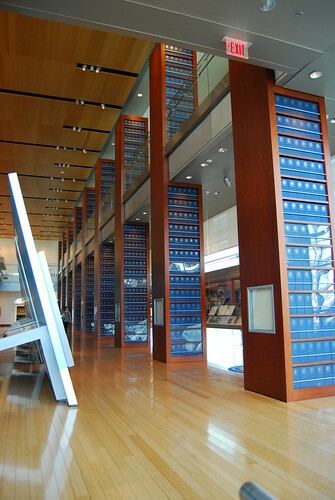 They are actually called "piers" and are glass-encased shelves holding hundreds of blue boxes filled with correspondence from the Clinton years. This correspondence represents only three percent of the Center's 80 million documents, the rest of which are archived in the library. Y'all know I make no secret of my admiration for my fellow Aries Al Gore. 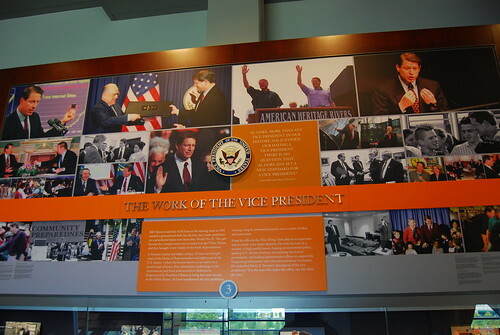 The Vice Presidential alcove and many other exhibits, some of them interactive, showcase the work and social activities of the Clinton administration. I wasn't allowed to take photos, so please check out that link for more information. 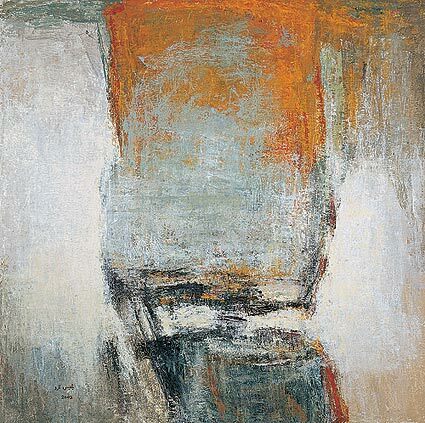 The exhibit will be in Little Rock until mid-September, then travels to Hattiesburg, Mississippi. Definitely worth seeing. A high point of my visit included running into a group of people who were at the Center for activities commemorating the forty-fifth anniversary of Martin Luther King's speech at the March on Washington (a speech that would be referenced by Barack Obama later that night in his acceptance remarks at the Democratic National Convention). The 2008 presidential campaign is proof to me that hopes of a better, fairer country, hopes my parents held dear and instilled in me, have become more than just dreams. We have moved toward accepting a person for the substance of his or her character, the reach of his or her vision, instead of making artificial judgments based on skin color or gender. We have stepped on to that bridge taking us into the twenty-first century and beyond. The Clinton Presidential Center is a truly spectacular place. Rather than putting a lot of photos here, you can see them in this Flickr set. Check them out and enjoy the worlds of art, fashion, music, and government that the center showcases.